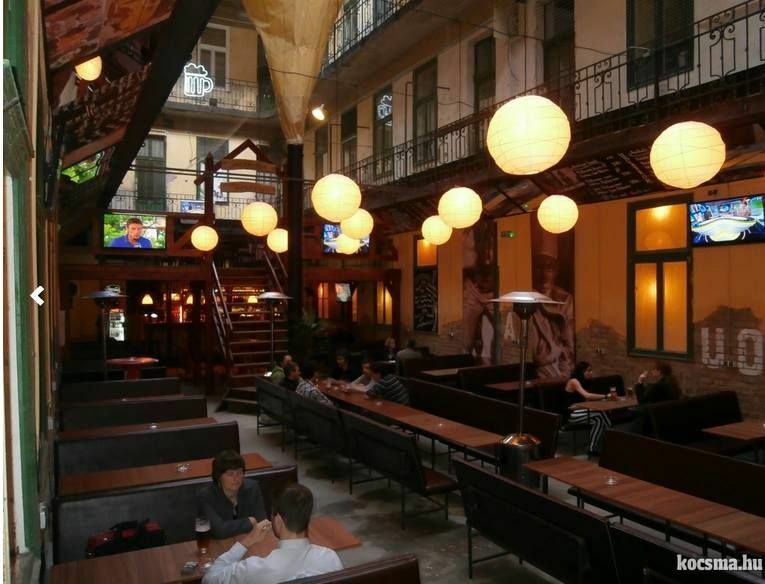 UdvarRom has a bit of a country design with the bar and the gallery above supported with wooden beams, but with all the lanterns and the inner courtyard of the old house you can feel the ’50s atmosphere as well. One thing’s for sure, here you won’t find a corner where you’d be a lonely cowboy, as spontaneous drinking buddies will show up in no time. The neverending benches give a good opportunity to find some mates, boys, girls, whatever you’re up to. Foreigners and locals visit regularly as well, so it’s definitely a place to make international connections. You probably won’t miss your favourite sport events, as there are multiple screens to watch and a merry company to join for cheering. If you’d rather prefer some pub sports, you’ll find table football here of course, but if you’d like to play other games, UdvarRom has table tennis and really cool retro arcade games too! Booze discounts will eventually make it quite hard to keep up with the game... Although the venue is in a fully open courtyard, they winterized it with some very smart ideas - obviously, heating is still the key of success. Reserving a table is absolutely free and recommended, as the place is full on every weekend!